Years ago, Ghost Town Software was the home of the Pikes Peak Trailguide, but starting in 2013 it is the home of the Factory Tools Apps. This is starting out small with 3 apps: the Kaizen Timer for Android, the PLC Simulator for Windows, and the Photo Music Creator for Windows. Oct 2013 Going back to Vancouver. The job market stinks in Ohio and my condo in Vancouver is falling apart so I'm heading back to fix it up and look for a job. Meanwhile, I'm adding a Ghost Town Software link to this page to spruce up my resume. Sept 2012 brings me to another new location. In August, I was growing tired of Long Beach and decided to move back to Ohio. My parents are getting old and I've been gone for 15 years, and this is a great opportunity for me to start up my old Ghost Town Software project. Because of that, this web site will be getting an overhaul and become secondary to the Ghost Town section. This will cause some links to quit working for a while. May 2010 brings me to another new location. In April I moved to Long Beach California when my production line closed. I was given the option of moving to our sister plant in Long Beach or getting layed off, so I took the plunge and headed to California. It looks like there's a lot to see and do down here, and I should find plenty to add to these web pages. I'm changing the format a little too. 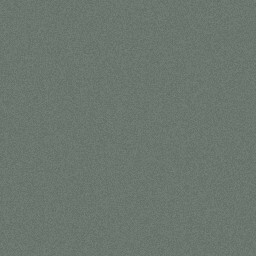 I'm using a slate and sand color scheme, and I'll be adding a page at a time like a blog, instead of waiting for whole sections. Nov 2009 brings another new look. I wanted to copy this site to a CD for friends but it's driven by server side scripts which can't run from a CD. So I wrote VB scripts to convert the plain text pages to HTM pages, which can run from anywhere, and while I was at it I changed the way photos are displayed. Instead of big photos popping up on a separate page, they now pop up on the same page as the thumbnail, which is way cooler. I also scrapped the old gallery page. It was displaying the photos that visitors are viewing most, but it turned out it was the same tired photos month after month, and hardly any of the cool ones. So now the gallery pops up ten photos that are picked at random from a list of my 100 favorites. And there are now two galleries: one for U.S. and one for Asia. Feb 2009 brings a new name. 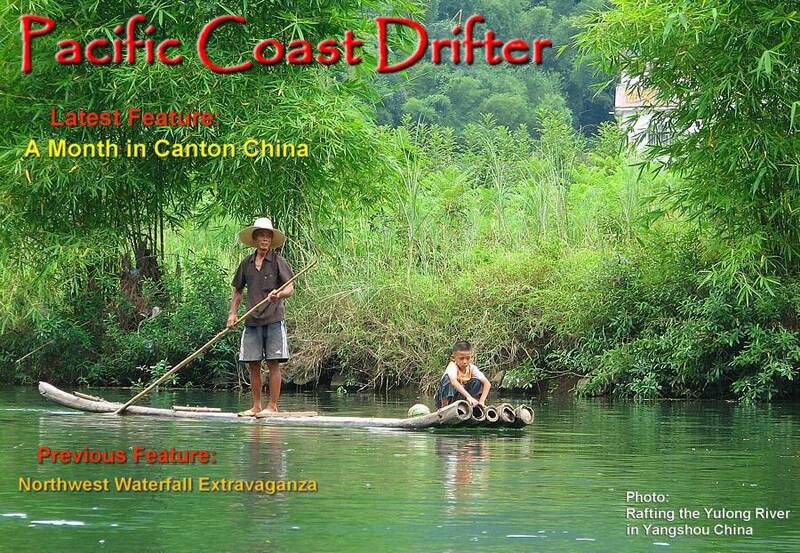 After losing the Pacific Coast Travels name to a web host boondogle, I had to come up with something new, and that is Pacific Coast Drifter. This new name has a nice ring to it and it's probably more accurate - my travels are too sporadic and drifter is a better description of my style. I also changed the color scheme to a more relaxing sand and tan look. Expect these changes to take a few months as I correct individual pages and re-sign my photos. 2008: What a difference a year makes. After spending three months in China in 2007 I did nothing interesting in all of 2008. No local trips, no overseas trips, and then to top it all off, I lost the PacificCoastTravels domain name. This is a long story, but basically I tried to change from the NetworkSolutions name server to the GoDaddy server, but it didn't work. The instructions from my web host (Alentus) didn't work and after several e-mails and a phone call, it still wouldn't work, but by then the name had expired and Network Solutions sold it to someone else. GhostTownSoftware.com still works but this seems to have cut my web traffic in half. To keep things fresh I uploaded a new section of photos from my Pikes Peak Trailguide. By the looks of the viewer counts in the Gallery, this seems very popular. The China trip still has as much traffic as the rest of the site combined but the Pikes Peak section is already in second place. I don't have any other trips planned for the coming year, but there's a good chance that I'll make it to Hawaii or Costa Rica. But I've been saying that for three years now. Spammers are still flooding my feedback form with their automated bots. They crawl the web looking for forums where they can post their host address in massive numbers in an attempt to get free advertising and a higher ranking in Google. My form has a trick question that stops bots but my web logs still track their activity and the numbers are unbelieveable. In November they submitted the form 700 times per day, which is every two minutes. None of those got through. 2007: Three Months in China. I spent last July and October in Dongguan China on business trips. Dongguan is about 100 miles north of Hong Kong and I had plenty of weekends to explore the area. These pages include plenty of stories and pictures of local parks, scenic coasts, Hong Kong, and a trip to the remarkable mountains of Goulin. The big irony is that July is the perfect time to explore Portland, and worst time to explore steamy south China. Other than that, things are moving in slow motion here at Pacific Coast Drifter. The only update to the site in the last year and a half has been the China section. It sounds like a lot of fun, but I haven't had the time or money to go places and shoot pictures. I've been promising trips to Canada and Costa Rica for more than a year, but these are delaying for yet another year. Since changing this site from the Pikes Peak Trailguide to Pacific Coast Drifter, the numbers of viewers has dropped to about a quarter of what it was two years ago. The majority of my hits are still for Pikes Peak info because Google is still indexing the site as GhostTownSoftware instead of PacificCoastTravels. I might have to split this into two web sites to get Google to index it correctly. Even worse, spammers are flooding my feedback form using automated bots that crawl the web looking for forums where they can post their host address. This is a pathetic attempt to get free advertising and a higher ranking in Google. It's a disease that affects feedback forms throughout the web. It doesn't work on mine because I installed a trick question on my form that stops bots. Going on my thirdyear in Long Beach California. More local sights, but not as exciting as I had hoped, and next week I move back to Ohio. This is my second year in Long Beach California. These pages include stories and photos of my new apartment and more sights that I missed last year. After six years in Portland it was time for a move. So when my production line closed I took the plunge and headed south to our sister plant in Long Beach California. These pages include stories and photos of getting settled in a new location. This group of pages gets me mostly caught up with pictures farther afield than the Portland stuff below, from 2007 & 2008 including: Moulton Falls, Eagle Creek, Lewis River Falls, Panther Lakes & Falls, The Ape Caves, & more. I'm years behind in adding new pages to the web site so this new section includes trips to Portland area parks from 2006, 2007 & 2008, including: Vancouver Lake, Ridgefield Wildlife Refuge, Lacamas Park, Marine Drive, the Japanese Garden, & Astoria. These pages include pictures I shot between 1998 and 2004 while researching my Trailguide CD-ROM. Now that the Pikes Peak Trailguide CD-Rom is discontinued, I thought I would post some of the pictures on the web. These pages span the entire Pikes Peak region, and include 100 of the 450 photos from the CD, plus a few others that I shot sometime later. This second trip features mostly local travel in southern China plus a week in Thailand. This six week business trip features plenty of travel to some of the exciting sights of southern China. I spent half the summer shooting some of the waterfalls in the region. This is only a fraction of the falls around here, maybe I'll get the rest next year. There's a ton of exploring to do around Olympic National Park. This weekend trip took a drive around the perimeter to check out the beaches and rainforest. The Portland area has several good places to go for a bike ride. Exploring Sauvie Island north of Portland. Biking Table Mountain Trail by Skamania. Vancouver has a scenic assortment of parks near by. More hiking and biking along the Columbia River. Hiking up scenic Eagle Creek to Punchbowl Falls. Hiking above Latourell and Oneota Falls in the Gorge. Hiking in Lewis River Park, north of Vancouver WA. Columbia River waterfalls and the giant sturgeon. After moving to Vancouver Washington, I started exploring the area. A trip to the Oregon coast including beaches, cliffs and forest. Exploring the beach and shipwreck near Astoria. Hiking in the Hoyt Arboretum in West Portland. The scenic park in Longview. In 2003 I made a trip to Portland to visit friends and take a quick tour of the area. Visiting the falls in the Columbia River Gorge. Climbing 800 foot Beacon Rock. Taking a drive up Mt St Helens. In 2002 I was in Maui, Hawaii. There's way too much to do there in one week. Touring the north west coast near Kanapali. Driving the Hana Highway through the rain forest. Visiting Haleakala and the big Aquarium. In 2002 I made a second trip to Penang Malaysia to visit friends. Jungle treking in Taman Negara National Park. Snorkling at Palau Payar island. In 2000 I made a business trip to Penang Malaysia, which included plenty of exploring. Penang Botanical Garden and Arboretum. In 2001 I was in Ouray and Silverton with my brother. This spectacular region includes towering mountains, forest and waterfalls. It's not exactly on the Pacific Coast, but they're still nice pictures. Exploring the mountains surrounding Ouray. Exploring the gold mining district above Silverton. Checking out the river and hot springs in Pagosa Springs. Riding my bike from Silverton to Durango. This is the original Ghost Town Software web site. If you're planning your next hike and bike vacation or just want a new place to hike this weekend you came to the right place. Click the title above for a wide variety of hiking and biking adventures, and enough major attractions to plan a whole vacation, in the mountains, forest, lakes and canyons of the Pikes Peak region. 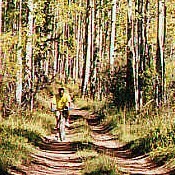 This includes dozens of photos and trail reports about hiking, biking, parks and sightseeing in the Pikes Peak Region. 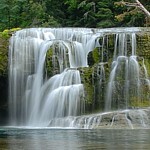 Providing the world with photos and information about Pacific Coast and other cool places. The site is always growing with more photos and reports added regularly, so keep watching.